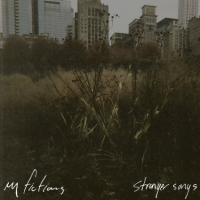 Topshelf Records continues its foray into 21st century emotive angst with My Fictions’ punishing Stranger Songs. My Fictions deal in controlled chaos in miniature, racing through Stranger Songs at a breakneck pace, cramming 10 songs into less than 30 minutes. Frantic, blitzkrieg drumming and darkly melodic guitar figures race around and around, spinning in ever-tighter circles that feel as though they could, at any moment, collapse in on themselves. Just before they do, however, the songs end or the tempos abruptly lessen, pushing the listener to the edge of anxiety and releasing just before they seek their own release from the aural onslaught. On “Postcard”, the shortest track on the album, an anguished scream of “I can’t focus anymore,” a frantic plea for help, emanates from the miasmatic swirl of discordant guitars and pummeling drums. It essentially sums up the overall feel of frustration permeating these tracks. From the appropriately dark guitars, stop/start rhythmic twists and turns, and overall tone of unease, Stranger Songs is a bleak, often beautiful, ultimately unrelenting listen that, unlike some other similar stylistic ventures, never overstays its welcome and manages to remain more or less compelling from start to finish.